Breaking News: Bush is a Woose! Looking to the day he leaves the White House, President Bush says he’ll concentrate on making speeches and running an institute that promotes democracy around the world. He also admitted that he cries “a lot” on God’s shoulder. Bush made the revelations to Robert Draper, for his book “Dead Certain,” which will be released on Tuesday. “I’ve got God’s shoulder to cry on, and I cry a lot. I’ll bet I’ve shed more tears than you can count as president” — an implied reference to the casualties of the Iraq war. Jimmy Carter has dedicated his life after the White House to conflict resolution around the world. Presidents George Bush the elder and Bill Clinton have campaigned together on behalf of communities devastated by Hurricane Katrina. So how does President George Bush junior imagine spending his retirement years? “I can just envision getting in the car, getting bored, going down to the ranch,” he says. He also has big plans for making money. “I’ll give some speeches, to replenish the ol’ coffers,” says Mr Bush, who is already estimated to be worth $20m. “I don’t know what my dad gets – it’s more than 50-75 [thousand dollars a speech], and “Clinton’s making a lot of money”. The insights into Mr Bush’s ambitions once he steps down from the most powerful job on Earth in January 2009 are contained in a series of interviews he gave to a journalist from GQ magazine. It may be that the writer, Robert Draper, comes from Texas, like his subject, but whatever the reason, Mr Bush has chosen to be singularly open with the author and provide a rare glimpse into the inner life of a very private president. During the course of six one-hour interviews, Mr Bush, feet up on his desk, munching on low-fat hotdogs, tells Draper of the loneliness of the US commander-in-chief. “Self-pity is the worst thing that can happen to a presidency. This is a job where you can have a lot of self-pity,” Mr Bush says. When it all gets too much for the president, his wife Laura storms to the rescue. “She reminds me that I decided to do this,” he tells Draper. The interviews came after Draper lobbied the president for several years to give him access, arguing that he would write the first draft of history on the Bush presidency. The book to emerge from their conversations will be published tomorrow, but an early taste was given in yesterday’s New York Times. The book’s title, Dead Certain, is ominously ambiguous, given the 3,728 US personnel – and by some estimates more than 70,000 civilians – who have died in Iraq since the 2003 invasion. For those around the world who are already perplexed by Mr Bush’s strategy in Iraq, his comments to Draper will not be reassuring. The president says to the writer that one of the failings of his prosecution of the war was that Saddam Hussein’s army was broken up, in contravention of Washington policy and leading to looting and chaos across Iraq. “The policy was to keep the army intact; [it] didn’t happen,” Mr Bush says. But, Draper points out, it was Paul Bremer, the man chosen by the president to administer country after the invasion, who ordered the disbandment of the Iraqi army. What did Mr Bush think when he learnt of that? Mr Bush says when his time in office is up, he will be only 62 and “really young”. Apart from the joy of getting bored, he is looking forward to setting up a “fantastic freedom institute in Dallas” for young democratic leaders around the world. There is at least one point on which the president and his detractors will agree. In a moment of breathtaking candour, Mr Bush laments the fact that the media no longer listens to him. “I’ve been here too long,” he says. Aww that is so touching…The Commander in Chief trying to look like he has a soul, but is really looking for some more designer drugs and a little blow. He can write his memoirs from a dark dank prison cell deep in the bowels of the earth after his trial in the Hague for his War Crimes. Aw shucks! 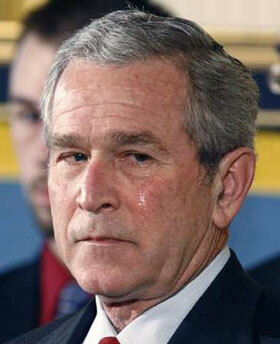 Don’t cry Dubya, yer mama will tell ya you’re the Messiah and everthin’ is gonna be alright!